Picking Tickets are documents that list all the items in the order that are eligible to be taken from stock (picked) and shipped from a particular warehouse. These items are listed in order by their picking sequence. A line prints beside each item where the stock clerk can enter the amount that was actually picked for shipment. Picking tickets may be printed for a range of orders. The program also allows the entry of a cut‑off date so individual items on the order may be ignored if the request date falls after the cut‑off date. The picking ticket may be printed on 8‑1/2 by 11‑inch paper to make it easier to work with, but standard‑sized computer paper is also acceptable. The picking tickets can be printed on pre-printed forms if you answered Y in COP Setup to the question Print Pick Tic On Forms? 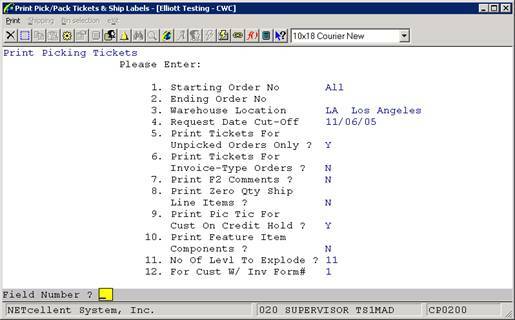 During selection of the range information for the picking tickets the operator must enter the starting and ending order numbers of the orders that are to be considered, the warehouse location, the request date cut‑off, whether previously picked orders should be considered and whether invoice‑type orders should be considered. The program will then print the picking tickets and then ask the operator for a new range. The operator will continue selecting ranges until all pertinent picking tickets have been selected. The program will print a picking ticket for each order that falls within the selection range that has at least one line item for which the request date is on or before the cut‑off date. Such orders must be of the type O (regular order). 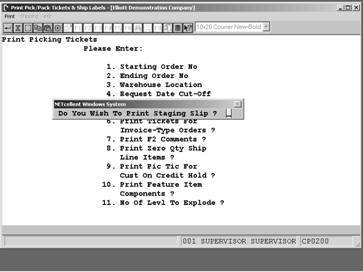 Picking tickets may be printed for invoice‑type orders if the operator specifically requests that this occur. Picking tickets may be printed twice for the same order if the operator selects this option, but duplicates are identified as such by a warning message that prints on the document. 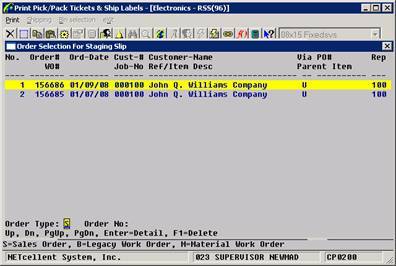 If the program detects that the value of the order when added to the customer's balance exceeds the customer's credit limit, a warning to that effect will print on the picking ticket, so personnel should be instructed to look for such warnings and to follow company policy when finding them. If the Bill of Material Processor package is used, picking tickets will distinguish between stocked and non‑stocked items and will show the components of non‑stocked items in such a form that the ticket can be used as a kit list for their assembly. The program will print a line upon which miscellaneous charges and freight charges can be written at the end of the picking ticket. If all line items on the order appeared on the ticket a message to this effect will also print. 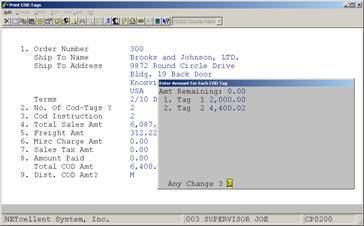 The picking ticket will also provide a work field for serial/lot numbers if the component is serial or lot. Another method is to batch pick all orders in one run and place the goods in a staging area. From the staging area you can pick individual orders much quicker than going through the entire warehouse. See the next chapter on Staging Slips for run instructions. Picking tickets may be printed on either standard (continuous) forms or laser forms. This option is set in the Print On Laser Forms? field #21 of the COP Setup application. If that field is set to P or B, picking tickets will automatically be set to print on laser forms. For more information, refer to the description for field #21 in the COP Setup section of this manual. A Packing List is a document that lists all the items on an order that have been taken from stock (picked) and shipped from a particular ware­house. Packing Lists may be printed for a range of orders. The program also allows you to select whether invoiced items should be included and items that have only been billed should be included. The Packing List may be printed on 8‑1/2 by 11‑inch paper to make it easier to work with, but standard‑sized computer paper is also acceptable. 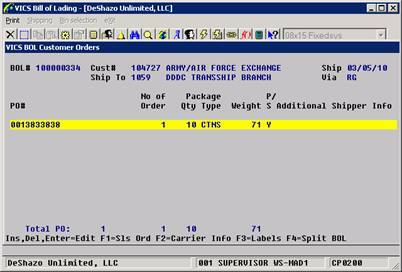 During selection of the range information for the Packing Lists the operator must enter the starting and ending order numbers of the orders that are to be considered, the warehouse location, whether invoiced items should be included, if billed items should be included, and if to print zero quantity-to-ship line items. The program will then print the Packing Lists and ask the operator for a new range. The operator may continue selecting ranges until all pertinent Packing Lists have been selected. 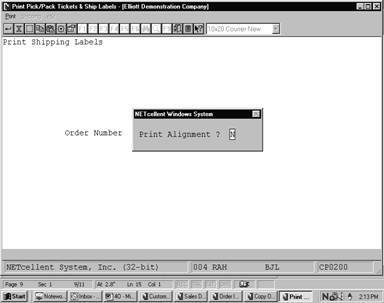 The program will print a packing list for each order that falls within the selection range that has at least one line item. Note: Packing Slips may only be printed for Invoice type orders or Regular type orders that have been partially or fully billed. Shipping Labels, are documents that list the order shipping address information. Each label will have the order number and the ship‑to information including ship‑to name, ship‑to address, city, state and zip. 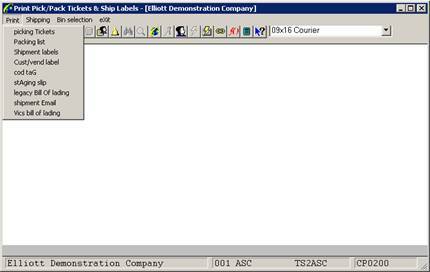 Define the label size in Label Code Setup in the Util_setup window off the Elliott main menu bar. Then define the default label code in COP Setup. You may select multiple orders and request multiple labels for each order. Enter the starting number of the range of orders for which you wish picking tickets to be printed. Defaults to All. Enter the ending number of the range of orders for which you wish picking tickets to be printed. Defaults to the starting order number. Enter the location code for the warehouse for which picking tickets will be printed. Only orders for this warehouse will be eligible for being picked. The location code you enter must be on file in the Location file. The description associated with this code will display beside the entry. Enter the date against which the request date for individual items on orders will be compared to determine if they should print on the order's picking ticket. Note than an item's request date may be revised after the order is entered, and this revised date is identified as the promise date. The program will use the promise date for comparison if it has been entered. This field defaults to the system date. If you answer Y, orders that have previously had picking tickets printed for them but have not yet been billed will be excluded from consideration for printing again. If you answer N, previously picked orders that have not yet been billed will be eligible to have picking tickets printed again although a message will print on the ticket to advise you that such a duplication occurred. 6. Print Tickets for Invoice-Type Orders? If you answer Y, orders with an order type of I will be eligible for printing. If you answer N such orders will not be eligible. Ordinarily, invoice‑type orders are used to record sales where shipment occurred at the time of the sale such as with over‑the‑counter sales. Thus, picking tickets are unnecessary. You may use invoices as ordinary orders however to streamline the order processing sequence, in which case you would want picking tickets to be printed. 7. Print F2 Comments ? If you answer Y, the comments that were entered during Order Entry will display on the picking ticket and the picking tickets will not print in picking sequence order. 8. Print Zero Qty Ship Line Items? If you answer Y, items with zero quantity to ship will be printed on the picking ticket. 9. Print Pic Tic For Cust On Credit Hold? If you answer Y, a picking ticket will be printed for a customer that has been placed on credit hold. Enter Y to print components of feature items on the picking tickets. Enter N to only print the parent feature item. 11. No Of Levl To Explode ? Enter the number of levels you wish to explode for non-stocked parent items. This question will only appear when the Bill of Material Processor package is being used. Enter the starting number of the range of orders for which you wish Packing Lists to be printed. Defaults to All. Enter the ending number of the range of orders for which you wish Packing Lists to be printed. Defaults to the starting order number. Enter the location code for the warehouse for which packing lists will be printed. Only orders for this warehouse will be eligible. The location code you enter must be on file in the Location file. The description associated with this code will display beside the entry. 4. Include Invoiced Items on List? If you answer Y, invoiced items will be eligible for printing. If you answer N such items will not be eligible. If you answer Y, billed items will be eligible for printing. If you answer N such items will not be eligible. 6. Print Zero Qty Line Items? If you answer Y items with zero quantity to ship will be printed on the Packing List. Note : If all line items on the order have zero quantity to ship, a Packing List will not be printed for this order regardless of how you answer this question. Enter the number of the order for which you wish to print labels. 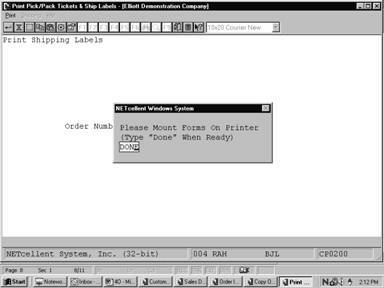 If you press RETURN for the first entry of an order number, the program will default to All orders, and the entry of No. of Labels will be skipped. Only one label will then print for each order. When you have entered all of the order numbers and number of labels to print, press the F10 key to print these labels. Enter the number of labels you want to print for each order specified. If you selected All for the order number, you will not be prompted for this entry. 2. M = Manually Manually distribute the COD amt. to the number of tags, Field 2. 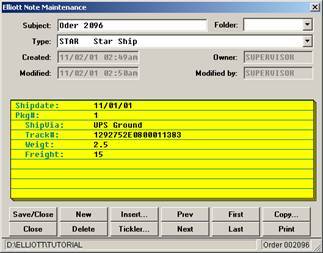 This feature is used to print a consolidated pick ticket (staging slip) for multiple orders. If you have a large warehouse and the number of orders is huge, the traditional method of using picking ticket to pick order one at a time is not efficient. A better method is to pick all orders in a batch in one run and place the goods in a staging area. From the staging area, you can pick your individual order much quicker than go through the entire warehouse. Staging Slips are also referred to as Wave Pick. To use this feature, it must first be setup as per the Global Setup instructions for Pick Ticket/Ship Labels . At the Print option, you the choice of printing Picking Tickets or Staging Slips. This is a process procedure because the system will not print a Staging Slip unless a Picking ticket has already been printed. 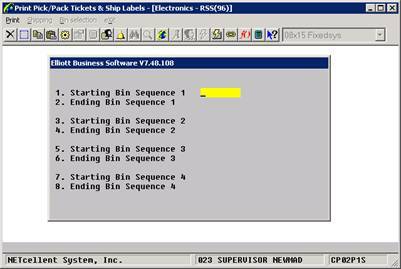 When you finish printing Picking Tickets and hit <Esc> or F10, the system will prompt you if you want to print a Staging Slip. At this point you may select “Yes” or “No”. 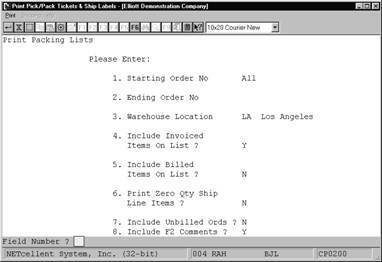 If you select “No”, then at a later time you can return to the Print Menu and select Staging Slips to print on an order-by-order basis. 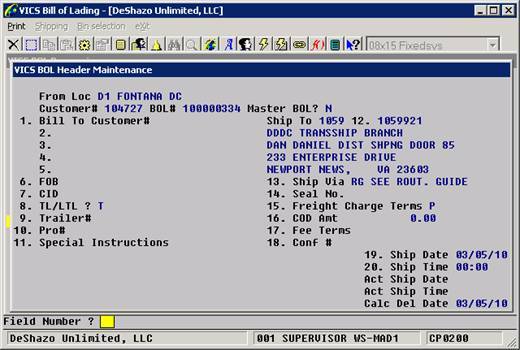 For field entry values and options, see Legacy Bill of Lading in the Global Setup document. Starship Manifest module must be installed or “Manifest” note duplicated in Elliott Notes. 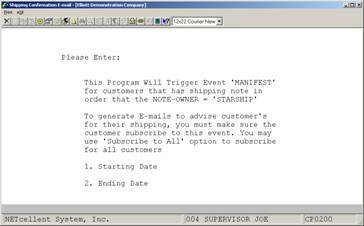 Enter the Starting and Ending Dates; the system will search and use the dates manually entered in Elliott Manifest Note or dates created automatically by the Starship Manifest module. 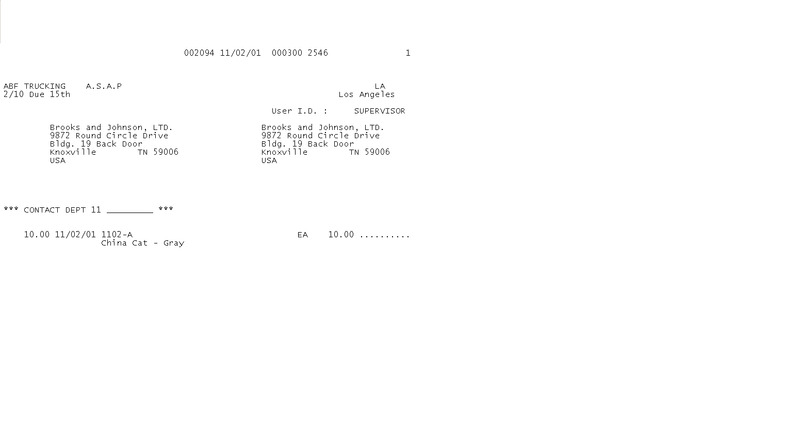 The VICS Bill Of Lading Global Setup. 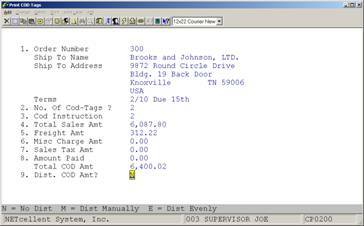 Create User Defined Codes in Inventory Management. These need to be added to all of the items that you will ship using the VICS Bill Of Lading. Review the Ship Via codes for proper values. Location: Enter the location of the warehouse. The value you enter here will be retained until you change it to make future processing faster. 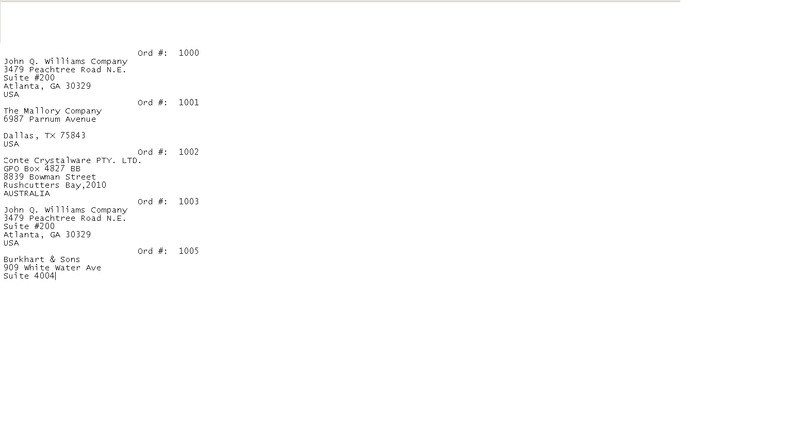 You can also press F7 to get a search window of location codes. Customer#: Enter the customer number. The F7 and F8 search keys are available to search for a customer by number or by name. You can press F1 to skip the customer number field and proceed to the BOL No field. BOL No: Enter a BOL number or press F1 for open bills of lading or F2 for all bills of lading. You can also press F5 to shift the prompt to the order number. 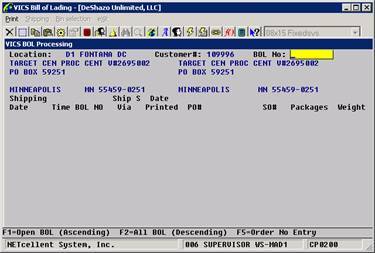 Orders can be grouped together on one bill of lading given the correct parameters. Generally, these are orders that are being shipped together to one location. Master BOL? – Most bills of lading will not be a master. A master may be needed if the customer requires individual shipments be sent in one load to a consolidation facility. BOL# - Leave this blank to allow the system to automatically generate the next BOL number. 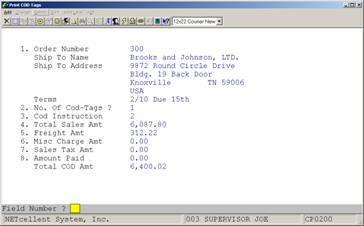 A number may be specified if you need to add orders to an existing BOL. Customer# - Enter the customer number of the orders. Starting PO No – Enter the beginning purchase order number for a range found on the sales orders. 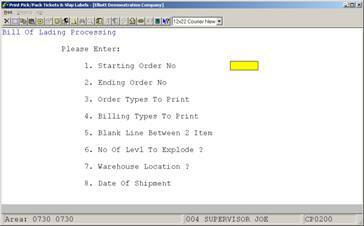 Ending PO No – Enter the ending purchase order number for a range found on the sales orders. Starting Order No – Enter the starting sales order number for a range to include in the BOL. Ending Order No – Enter the ending sales order number for a range to include in the BOL. Ship To No – Enter a ship-to number found on the sales orders. Leave it blank for All. Ship To X-Ref# - Enter a ship-to cross reference number found on the sales orders. Ship To Zip Code – Enter a zip code found on the sales orders. Ship Via Code – Enter a ship via code found on the sales orders. Ship Date – Enter a date and the ship date on the sales orders must be on or prior to this date. Select Order Pick Ticket Printed? – You can select orders that have a picking ticket and give a cut-off date. Select Order Selected for Billing? – You can select orders that have already been selected for billing. Each bill of lading contains a header that specifies certain characteristics about the shipment. The FOB, Ship Via, Freight Charge Terms and Ship Date can be updated on all of the orders within the bill of lading when it is completed. The Pro# is much like a tracking number. If it is populated, a ship note will be created with this value as the tracking number on all the orders. The Confirmation# may be required by some customers for the advanced ship notice. Special Instructions entered will print on the bill of lading in a predefined area. Each purchase order will be displayed for the BOL, how many orders are on the PO, the package quantity and type, the weight, and other information. 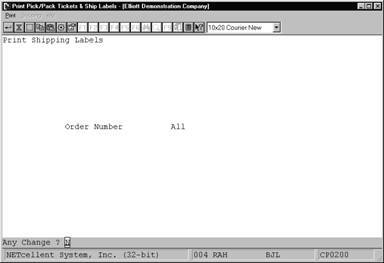 You can further drill down to the sales orders by pressing F1, view the carrier information by pressing F2, print labels for the BOL by pressing F3, or split the BOL by pressing F4. You can also add to or delete from the BOL in this screen. Press the F4 key to print the BOL. The BOL is designed to print on a laser printer and a laser overlay is provided for your convenience. If a supplemental page is required, a separate print job will be generated. Some criteria may be required before the BOL will print, like entry of a pro number. If a BOL needs to be changed or is printed by mistake, you can press F7 to void the print. Press the F5 key to complete the BOL. This should be performed once the shipment has left your facility. This marks the BOL as completed so it does not appear with the other open bills. 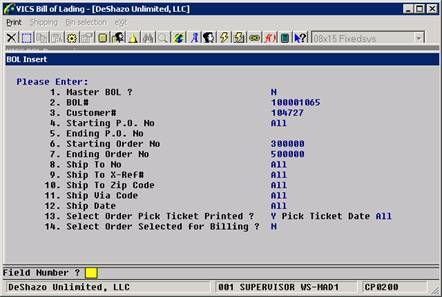 Also, billing selection can be performed automatically for all orders on the BOL. The BOL must be printed before it can be completed. If a BOL needs to be corrected or is completed by mistake, you can press F7 to void the completion.